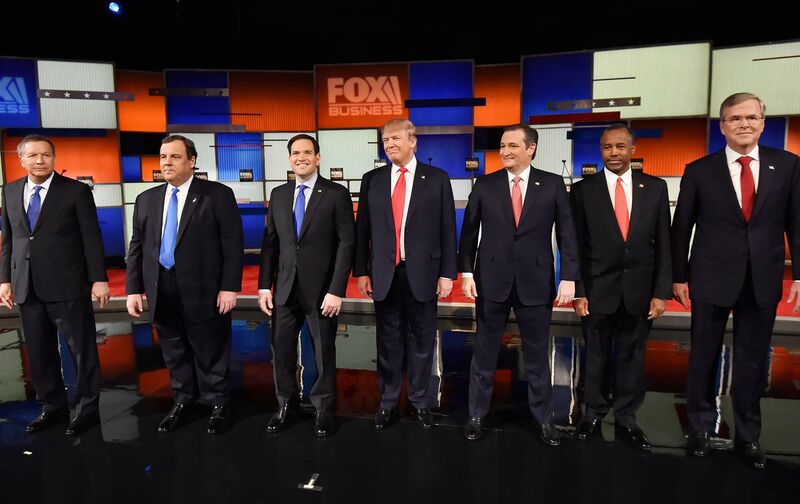 The Republican debates are going from bad to worse—by design. Rand Paul was excluded from Thursday night’s Republican debate. But the senator from Kentucky still delivered the most cogent analysis of the forum, when he flipped off everyone involved. Then Trump assured Cruz that, while he would never bring a lawsuit challenging the Canadian-born senator’s status as a not a natural-born citizen, Democrats surely would do so if Cruz were to secure the Republican nomination. “You have a big lawsuit over your head while you’re running. And if you become the nominee, who the hell knows if you can even serve in office,” said the billionaire. This was a debate that could have used some Lindsey Graham talk about rational responses to immigration and respect for American Muslims. This was a debate that could have used some Rand Paul talk about avoiding quagmires or ending the drug war or defending privacy. The point here is not to suggest that Graham (if he was still in the race) or Paul or any of the other excluded contenders would have arrived as visionaries, or even candidates with right answers to every question. Far from it. But they might have provided an alternative to the empty squabbling of grown men who had obviously spent very little time preparing to talk seriously about issues—and very much time preparing to talk trash about one another. The Republican debates are going from bad to worse not by chance but by design. That’s what Paul was complaining about on Thursday. Paul’s frustration was not surprising. He is anything but a front-runner in the Republican race, but he is a credible contender who was elbowed to the sidelines in a process that relies on bizarre and frequently unfair readings of polling data—and that seems, increasingly, to be about entertainment and ratings rather than issues and ideas. Rejecting an offer to appear in another of the ridiculous “under-card” debates the the GOP and its “media partners” have organized, Paul raged all day Thursday against the process. And Thursday night’s debate proved he was right to do so. The exclusion of that perspective from one of the last two Republican debates before the Iowa caucuses was troublesome—for the party and for the country. So, too, was the loss of South Carolina Senator Graham, the steadiest critic of Trump’s crude attacks on immigrants, from both the debates and the race itself. Without alternative voices and views on Thursday night, what was supposed to be a debate was often just a petty exercise that saw the Republicans bashing President Obama, Hillary Clinton, Bernie Sanders, and one another. Rejected? No, President Obama was elected twice with overwhelming popular-vote majorities and Electoral College landslides. There really were points at which Thursday night’s debate seemed delusional. At other points, it was just plain weird. Within minutes, Cruz was spinning scenarios that ended with the senator mentioning that Donald Trump’s mother was born in Scotland. So that was settled. But not much else. Debates don’t have to be this way. They can be meaningful. They can matter. There are still some Republicans who want to be a part of such debates. But they weren’t allowed on the stage Thursday night.